We provide elite creative service for your business name, team name, and other slogan needs. 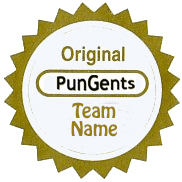 Let the Pun Gents name your business, your team, or special event. We’ll even create your roller derby name (a surprisingly common request!). See testimonials and recent requests. You must pay in advance for this special service. To confirm your paid request, process your order via the shopping links above. Include your request in the ‘order notes’ section of the checkout. The Gents will fill your custom request within 48 hours max!